Most of you, dear readers, have met at least one of the Ladies of Comicazi in person. 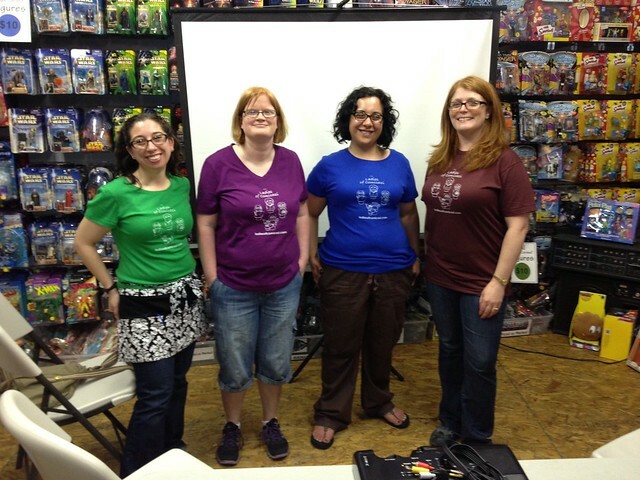 But you may not know how we came to be the Ladies of Comicazi: how we got involved with the store and how we met each other. With that in mind, I'm kicking off a new four-part series, to be continued whenever we feel so inclined, to delve into the origins of the Ladies of Comicazi. Comic books have been a part of my life for a long time. It's difficult to remember exactly how it started; I'm not someone who can recall her first comic. Somewhere between my dad reminiscing about comics from his own childhood and the occasional issue of something - most likely Disney related - catching my attention, I figured out that I liked comics. My sister was the one who got seriously into superhero comics and I followed along, eventually picking up a few titles on my own. X-Men was the big thing at the time. We had seen the TV series and that led to us reading the comics and picking up backissues and trades to better understand the story. The trip to the comic shop - one of two local stores we had to choose from - became a weekly ritual that I observe to this day. Though my first comic is lost to the ages, I can remember other details: the first time I read X-Men #1 (adjective-free, not Uncanny), the first collected superhero story I ever read (Fantastic Four: Trial of Galactus, which I probably didn't understand very well), and the first time I read Mad Love (which I liked, but really didn't understand until later). I learned about independent comics through - shockingly - Wizard magazine and started picking up Strangers In Paradise (which I never finished) and Bone (which I did). The people I was hanging out with at the time - one of whom I dated and eventually married - broadened my horizons and my appreciation of comics further. Though animation remained my first love, most of my college friends were in the sequential art department, ensuring that I didn't give up comics after I left home. I have always been very lucky with comic shops. Wherever I've been for any extended period of time - including a family vacation to London, I've always had at least one comic shop nearby. I've also never had anyone make me feel uncomfortable as a woman in a comic shop, which not all women can claim, sadly. That said, I have been in comic shops that had problems: poor organization, inattentive staff, minimal selection, or just an unpleasant atmosphere. This makes me appreciate a comic shop that gets it right all the more. The biggest aspect that separates the best comic shops from the mediocre to bad ones is the people: the ones who know your name, know what you buy regularly, suggest comics that you might enjoy, keep the store in good order, and generally make it a welcoming place for regulars and new customers alike. That's why when Mike and Bob left the store they had been working at to start Comicazi, my then-boyfriend-now husband and I followed them, along with several of our friends. To me, it's that sense of community and belonging that keep brick and mortar comic shops relevant as digital becomes more of a force in the industry. I've been to other comic shops. I've bought things from other comic shops. I've had conversations with total strangers about Doctor Who in other comic shops. But Comicazi is where I've bought comics weekly. Comicazi is home. I met my fellow Ladies in May of 2011, after a rather rough couple of months that left me moody and withdrawn without much reason. With a bit of prodding from my husband Franksenstein, I decided to give Muppet Trivia at Comicazi a shot. Muppets were another longtime passion of mine and I'd been learning more about them recently, thanks to the episodes of The MuppetCast I listened to while walking the dogs. I'm normally kind of shy around people I don't know, so I didn't go in convinced that I would make new friends. But having a randomly assigned team and a job to do actually makes conversation a lot easier, particularly when that job is something you're pretty good at. Leading my team to victory gave me the reason and the confidence boost I needed to chat with the hosts. And that's how I met The Red Menace and Smalerie. There isn't a whole lot more to the story because it didn't take much more for us to become friends. There was some more prodding from Franksenstein before I worked up the courage to suggest a dinner meetup,but everything went pretty smoothly from there on. I believe I met Tiny Doom at a Comicazi Game Night, though I'm sorry to say I can't recall which one. The name "Cartoon Sara" was bestowed on me by Smalerie, who has many Sara/hs to keep track of and gave me one of the better titles, which I happily adopted. Making such amazing new friends was exactly what I needed to break out of my lengthy funk and to keep me from falling back into one. So when I got the formal and very flattering invitation to join the Ladies of Comicazi blog, there was no way I was going to turn it down. If you would like to meet your new best friends, or possibly just have fun answering trivia questions about the Muppets, Sesame Street, Fraggle Rock, and other Jim Henson creations, we have some good news for you! Muppet Trivia is returning to Comicazi on Saturday, August 17th! Your hosts this year will be three out of four Ladies of Comicazi: The Red Menace, Smalerie, and yours truly. There will be fun, there will be snacks, and of course, there will be Muppets. Mark your calendars and keep your browsers pointed to our blog, as we'll be sharing more information about what you can expect as the date approaches.